﻿ Real Madrid and La Liga challenge: No margin for error! 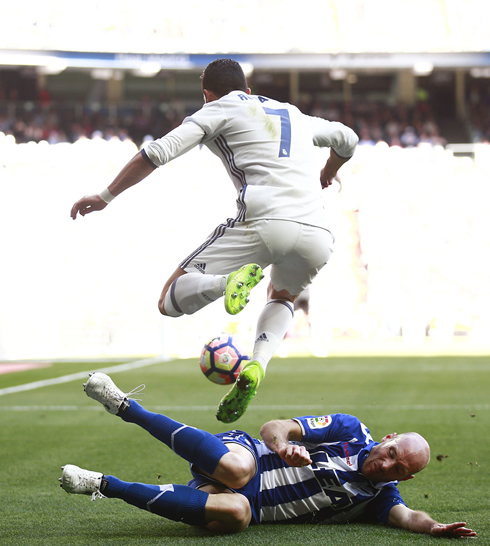 04.04.2017 » Real Madrid and La Liga challenge: No margin for error! We're entering the decisive stages of the season and Real Madrid are in the pole position to become Spanish champions. In a month where the Merengues will play both Atletico and Barcelona, can Zidane keep the intensity levels high in all their fixtures? Real Madrid faces Leganes this Wednesday (April 5), on the same day Barcelona hosts Sevilla at the Camp Nou. The last time Madrid and Leganés faced each other it ended with a Merengues 3-0 win (November 6 of 2017). On that day, Gareth Bale found the back of the net in two occasions while Morata scored just once. Ronaldo has been scoring a goal every 136 minutes, shooting at goal an average of 5.47 times per game. To hit the target, Ronaldo needs an average of 7.45 attempts/shots. This season only, he scored a hat-trick in two occasions already, recorded 11 assists and netted 22 goals for Real Madrid. His passing accuracy has been near the 80%, which is a good indicator given his position on the pitch. On the other side of the barricade this Wednesday, the spotlight will be on Alexander Szymanowski, Leganes top scorer. In 21 matches, the Argentinian scored 5 goals and recorded 2 assists. His statistics in comparison to those we just showed from Cristiano Ronaldo look pale, but that's not anything we should be surprised with, given Leganes sitting in La Liga's 16th place in the table and having the worst attack in the league (only 23 goals in all season). Real Madrid has more than enough reasons to approach this game carefuly. Looking at La Liga table, we can immediately see Malaga, Leganes and Deportivo tied with 27 points and in desperate need of more points to escape even further from the relegation zone. 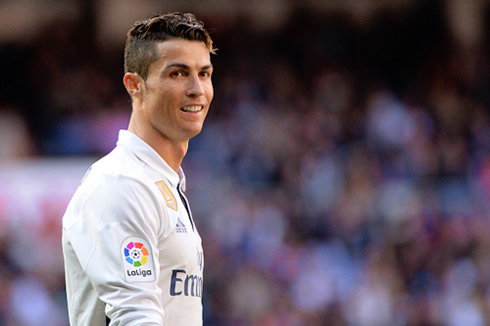 Hopefully, Real Madrid can find a way to score a goal early in the game, which in case of happening, will certainly turn the game easier for Cristiano Ronaldo and his teammates. Real Madrid players have already begun the preparation for tomorrow's game this past Monday, but Zidane won't be counting with Raphael Varane, who aggravated the injury he picked up against Valencia back in February. 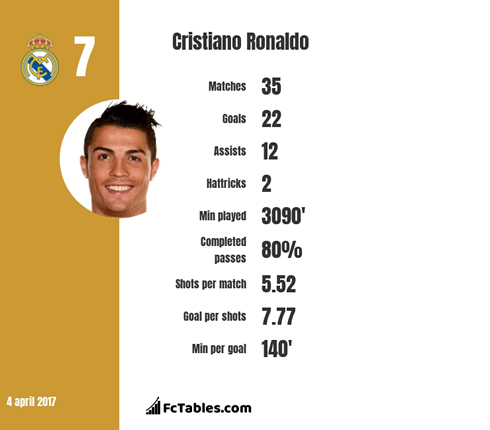 You can find more Cristiano Ronaldo statistics on FCTables and their dedicated Cristiano Ronaldo Statistics page. You may also take a look at their H2H tables and stats, where you can compare how these teams have been performing against each other: H2H Leganes Real Madrid. Cristiano Ronaldo next game is a La Liga fixture, on April 5 of 2017 against Leganés. You can watch Juventus live stream, Leganés vs Real Madrid, Barcelona vs Sevilla, Chelsea vs Manchester City, Arsenal vs West Ham, and Liverpool vs Bournemouth, all matches provided from our sports live game pages.